Question: When is a digraph not a digraph? Written language turns our continuous stream of speech into distinct static units, separated by spaces, on paper or on a screen. These static units are words. Words are the smallest units of meaning needed for verbal thought. They are combined into larger units of phrases and sentences when we are thinking about the world and everything in it. In an alphabetic language like English, words are written with letter symbols. These symbols were originally invented to represent the sounds in spoken words. These perceived sounds were abstracted from the speech of the people of the community. The inventors of writing had to analyse the speech of many speakers to derive the common sounds that made up spoken words. It was found that there are no ‘pure’ speech sounds, as such, because the sounds vary according to the pitch, tone and quality of the speaker’s voice, as well as the position in which they occur within a word. Hence, the sounds had to be put into ‘categories’. These categories of sound are called phonemes. The corresponding symbols (letters) are called graphemes. Children learn that letters are linked to the sounds in words. Until this stage in their lives children have had no need to be aware of the sounds within words. In fact, human speech proceeds at too fast a pace for us to pick out the sounds within words. Whilst they have been learning to talk, children have been attending to the meaning of words and phrases, not the sounds within them. No one needs to be explicitly aware of these sounds until they learn to write and read. Our reading scheme begins with very simple picture books containing an illustration and a few words on each page. Each illustration is closely related to the words on the page so that the meaning of each word is clear. This ensures that children have something they can relate to before they go on to learn about the letters in written words and the sounds corresponding to them. 1. Teachers can say the whole word first, so that children clearly know how to pronounce it. By doing this they also check that the word is in the children’s spoken vocabulary and it is meaningful to them. 2. Teachers can split each word into the sounds within it – its phonemes. At this stage each phoneme corresponds to a single letter. By saying each sound separately, children learn which sound corresponds to which letter. By practising splitting words in this manner, children will soon be able to say each sound separately too. 3. Teachers may also split each word into ‘onset and rime’, e.g. c-at, m-at, h-at, b-ig, b-ox, or they may split each word into ‘body and coda’, e.g. ca-t, ma-t, ha-t, bi-g, bo-x. Both of these ways of splitting words phonologically are more natural in human speech than the splitting of words directly into phonemes, some of which are almost impossible to articulate alone, e.g. b, p, t, d, c, k, g, j, because the smallest unit of articulation is a syllable. 1. How to write each letter. While children are practising writing each letter, they can also say the sound that corresponds to it. 2. How to write the whole word by writing the letters in the correct order from left to right across the page (with spaces, the width of the little finger, between each word). In this way children learn how to spell the word. Their visual memory for the letters and the order in which they appear in the word grows at the same time as their memory for the sounds in the word. While children are going through the above process, they are learning how letters correspond to sounds, how to write letters and how to write words. This process is the basis of learning the grapheme/phoneme correspondences which occur in written English. In our reading scheme the letters of the alphabet are first seen in phonically regular CVC words, (consonant-vowel-consonant). 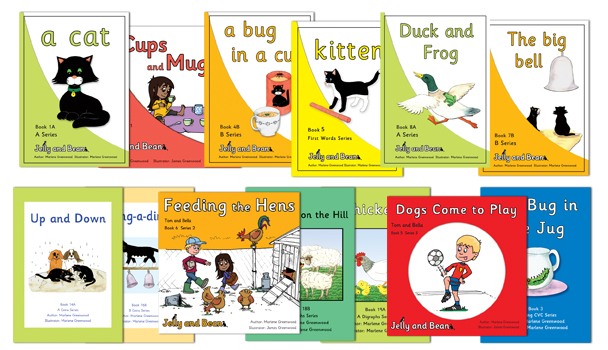 The first letters introduced in books 1A and 1B in our AB Starter Pack are ‘a, c, t, h, m, o, n’. These letters appear in the words ‘cat, hat, mat, man, hot, cot’. In books 2A and 2B we introduce ‘b, i, g, x’ in the words ‘big, box, bat, tin, bin’. In books 3A and 3B we introduce ‘d, l, f, r’ in the words ‘dog, log, frog, mad, bad’. In book 4A we introduce ‘e, u, s’ in the words ‘bed, mud, rug, cats’. These phonically regular words are joined by other common words which are not of the form CVC. These words are ‘the, a, and, in, on’. It is not possible, at this stage, to split the word ‘the’ into its grapheme/phonemes correspondences because none of the letters are pronounced in the same way as they are in simple CVC words. Children have to learn it as the specific letter combination that makes up that specific word. It is possbile to split the word ‘and’ into its grapheme/phoneme correspondences, but children may find it easier to simply remember ‘and’ by its specific letter combination too. Also, the word ‘a’ is not pronounced in the same way as it is in ‘cat, hat, mat’. Children simply have to learn how to pronounce it when they see it as a single letter word in a phrase or sentence. There are no capital letters introduced initially, so that children get used to lower case letters first. This part of our reading scheme corresponds to Phase 2 of Letters and Sounds. The next part of our reading scheme corresponds to Phase 3 of Letters and Sounds. Our next series of books, 5A -10A and 5B – 10B, introduce the rest of the letters of the alphabet. These are ‘j, k, q, v, w, x, y, z’. Common words, not of the form CVC, are also introduced at this stage. These words are ‘see, look, me, my, with, oh, no, very, is, has’ as well as the names Jelly, Bean, Lotty, Kevin and Wellington. These words are introduced early in the reading scheme so that children learn that letters in words are not always pronounced in the same way, e.g. ‘e’ in ‘bed‘ is not pronounced in the same way as ‘e’ in ‘me’, and ‘o’ in ‘dog’ is not pronounced in the same way as ‘o‘ in ‘no’. The English language has multiple correspondences for all its letters and sounds and some words are more easily learnt directly from their spellings (orthography). As they progress through the next few books children practise reading regular CVC words, and at the same time, they learn more common non-CVC words, such as ‘to, go, you, are, said, away, for, play, down, out’, in books 11A – 16A and 11B – 16B. Children are now developing their orthographic memory for the specific spellings of words. They are using syntax, meaning and grammar to help them identify words. They are also becoming more fluent in their reading. Words with more than one consonant at their beginning and end are also introduced. This gives children experience in blending these consonants together in words such as ‘frog, grass, skip, swim, black, bell, jump, pond’. The next words we introduce in books 17A – 24A and 17B – 24B are those containing consonant digraphs. A digraph is two letters written together to represent one sound, e.g. ‘sh’ in ‘ship’, ‘th‘ in ‘this’, ‘ch’ in ‘chicken’, ‘ck’ in ‘duck’, ‘ng’ in ‘ring’. Words containing digraphs are included in the next set of words for children to learn directly from their spellings, i.e. ‘he, she, they, her, come, do, two, who, little, all, goes, does, water’. Words containing vowel digraphs are also introduced at this stage so that children learn the letter combinations that represent vowels in the English language. The digraphs are ‘ay, ai, ee, oo, ow, ou, er’ as they appear in the words ‘play, rain, see, look, down, out, water’. This means that children will be able to pronounce other words with the same vowel spellings when they see them, e.g. ‘stay, laid, bee, took, town, about, over’. Then words with other vowel digraphs are introduced in the Early Vowels Series and English Vowels Series. These contain the English vowels sounds with the spellings ‘ar, or, ur, ea, ie, oa, oo, oy’. The words include ‘farm, storm, burn, leaf, pie, boat, moon, toy’. At this stage all the sounds of the English language have been used in the vocabulary of the stories. More irregular words are also introduced including ‘where, there, here, some, want, move, one, watch, what’. The common vocabulary in the stories helps children to gain fluency when reading. The stories in the later series for Phonic Phase 5 of Letters and Sounds introduce words with multiple letter/sound correspondences, e.g. the vowel sound in the middle of the words ‘storm, crawl, caught, wall’ has four different spellings, and, e.g. the letters ‘ea’ in the words ‘head, leaf, break’ are pronounced in three different ways. These multiple letter/sound correspondences make English a difficult language to learn to read and write. It is said to have a ‘deep orthography’, i.e. many spelling/sound correspondences are found in the written words. These later stories are also written in the past tense, so that children meet words ending with ‘ed’, e.g. ‘wanted, jumped, dragged’, where the ‘ed’ is pronounced differently in each word. Common verbs like ‘saw, was, were, could, would, thought, took, came, heard’ are also introduced. Whilst children are learning to recognise more words using their orthographic memory, they are also becoming more fluent readers at each level. The vocabulary in the books is especially made up of common words that we hope children have already met in their spoken language. There is no intention to include uncommon words to expand children’s vocabulary at this time. The aim of the scheme is to help children turn the words they know from speaking and listening into a written form so that they get over the first hurdle on the road to becoming literate.